It has been a few years since we had the opportunity to hand out neighbor treats. Last year we were in Dallas, TX at the Marriott. I made a few things (we had a suite with a full kitchen) to give to the front desk and they were very appreciative of them. 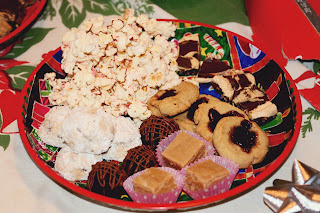 I have also been with family and we set aside one day to make enough goodies for a small army. It was wonderful for several reasons. First we got to be together in the kitchen. Secondly, we shared and learned new recipes. Thirdly, many hands make light work. It was just a fun time. This year we don't know many people but we do have neighbors. The kids and I talked about what we would like to make and what would be kid friendly to make. Some recipes I have you practically have to have a science degree to get them to work…LOL We don't make those every year. We always enjoy taking them to the door and wishing them a Merry Christmas and Happy New Year. This year our neighbors returned the favor and we reaped the reward of our labors. Thank you for the cookies, candy and bread! They were all so tasty good. This is a list of what we made, along with links, pictures and recipes. If you have a food processor, add the cookies (cookie and cream) and make them into a fine mixture. Soften the cream cheese. Mix the two together and cool in the fridge for 30 minutes. Using a cookie scoop, scoop the dough and place on a cookie sheet lined with parchment paper. I do not hand roll my truffles…it's too time consuming. Melt your chocolate chips using your favorite method and pipe across the oreo truffles in a zig zag motion. 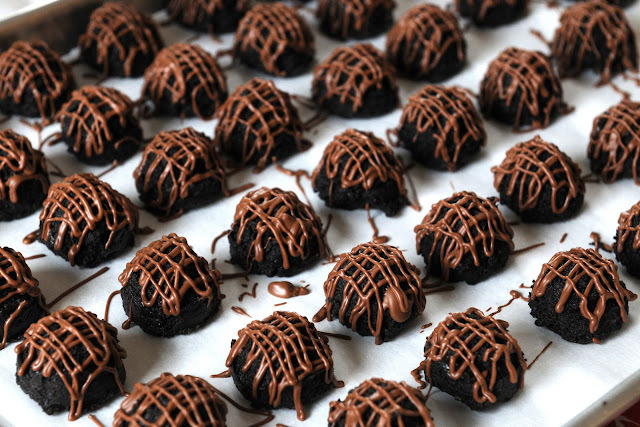 You can also dip you truffle in chocolate and decorate with white chocolate. 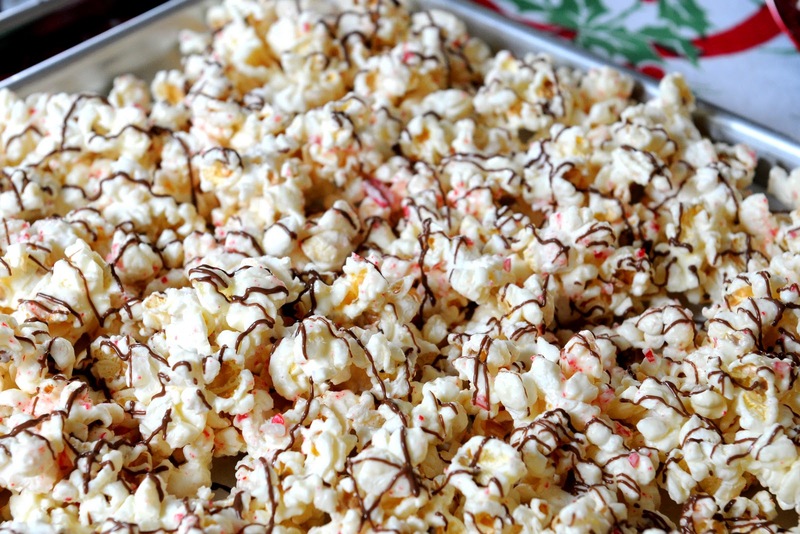 Peppermint Bark Popcorn I used the recipe for the for this treat from Our Best Bites and it was submitted by Sara. The recipe can be found here. Picture below. Peanut Butter Fudge I used my own recipe. I did a post about this last week. It can be found here. Powdered sugar to coat Pecan Balls with after baking. In a medium sized bowl, cream butter with electric mixer until lemon color. Add sugar and vanilla. Add flours and nuts. Place dough in refrigerator for 30 minutes. 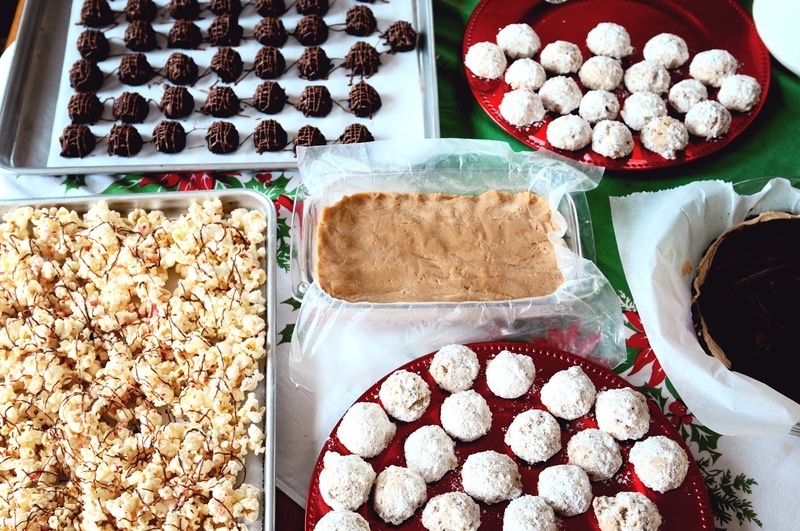 Using a cookie scoop, scoop pecan balls onto a parchment lined cookie sheet. Bake at 350 degrees for 15 minutes. Immediately after removing the pecan balls from the oven, roll in powdered sugar and place on a cookie rack to cool. Peanut Butter NanaimoBars I use this recipe from my blog found here. It is out of this world, crazy good! So there it is. A lot of yummiliciousness in one spot. Enjoy!